Moncef Marzouki, the president of Tunisia from 2011 to 2014, has penned an analysis predicting, as I have, the demise of Islamism. I quote from a MiddleEastEye.net abridgement and translation of the original Arabic version that appeared at Aljazeera.net. 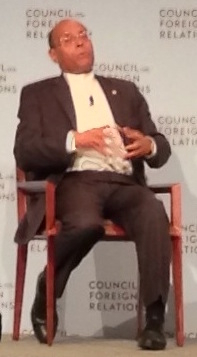 Tunisia's former President Moncef Marzouki, shown here at the Council on Foreign Relations in Sep. 2013, predicts the imminent decline of Islamism. Marzouki, a liberal human rights activist who returned from exile after a popular revolt brought down dictator Zine El Abidine Ben Ali, became president under a power-sharing agreement following Tunisia's first free parliamentary elections in October 2011, heading a government dominated by the Islamist Ennahda party. "We do not have the same point of view on women's rights, human rights, and so forth," he lamented to Time magazine in 2012. In this article, Marzouki begins by placing Islamism in the context of three other isms: nationalism, pan-Arabism, and communism, all of which have declined. Today, he writes, we are "about to see the decline of a fourth wave, Islamism, after witnessing its launch in the early 1970s and reaching its peak in the late 1990s." Like other isms, "Islamism expanded as a result of society's wish to solve all or some of its problems." Today, "awkward questions" are being asked: "Have you fulfilled all of your promises? Did you live up to the high hopes that were placed on you? In the end, what did you achieve?" He notes the gaudy current Islamist achievements but dismisses them, recalling that the Soviet Union "was seen as a power that will stay for the next thousand years" but, in fact, "collapsed like cardboard, albeit gradually, but not many people foresaw it. That's exactly what is happening today with regards to the Islamist current." Most Islamist parties lose their way and "mutate into right-wing parties looking for a place in power," without regard to morality or principle. Islamists "use an ideological cover for a tyranny that is ... repressive and corrupt." Marzouki calls most armed Islamist groups "the biggest contemporary disaster that the Arab and Muslim nations - and even Islam – are facing. ... Thanks to them, the whole world regards us as a nation that has nothing to add other than breeding terrorism. We are perceived as a threat to the rest of the world." In a 2013 op-ed, I noted that Islamist movements are becoming increasingly divided along sectarian, ideological, political, and tactical lines (which I subsequently discussed in more detail here). "Should the fissiparous tendency hold, the Islamist movement is doomed, like fascism and communism," I wrote, "to be no more than a civilizational threat inflicting immense damage but never prevailing."